Managing Phosphate for your crop can be a challenging task. Similar to Micronutrients, Phosphates are sensitive to soil fixation, making them unavailable for the plant. 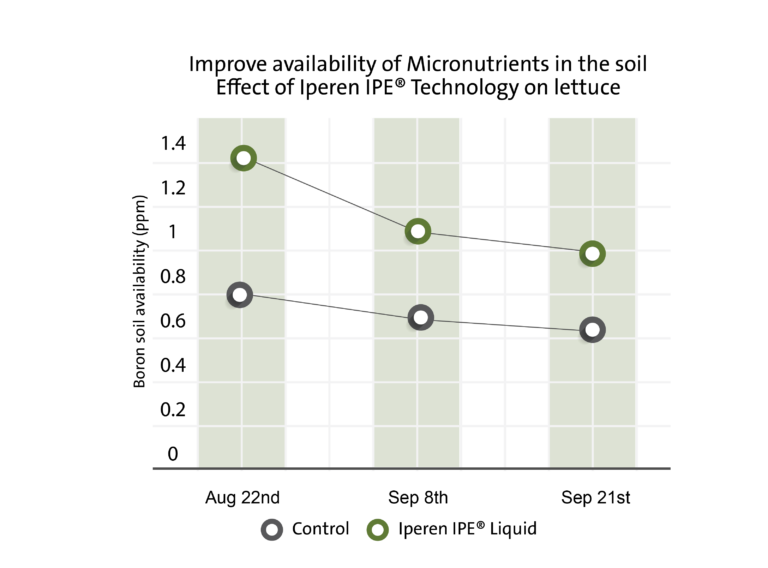 To reduce fixation, localized application will help, but this is not always sufficient. This is why we developed Iperen IPE® Technology to better manage Phosphate and Micronutrients efficiency. 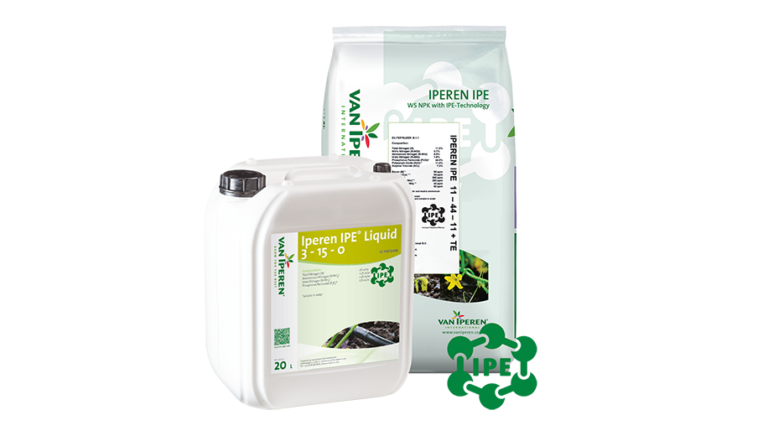 Iperen IPE® Technology significantly increases the level of Phosphate available for the plant. It releases Phosphate absorbed to soil particles and prevents fixation of fresh applied Phosphate. 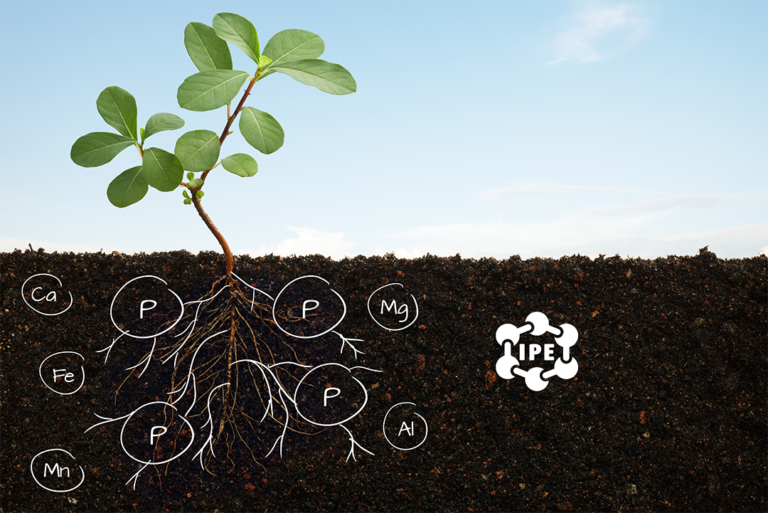 This is how the Iperen IPE® Technology has a clear effect on the initial plant development. 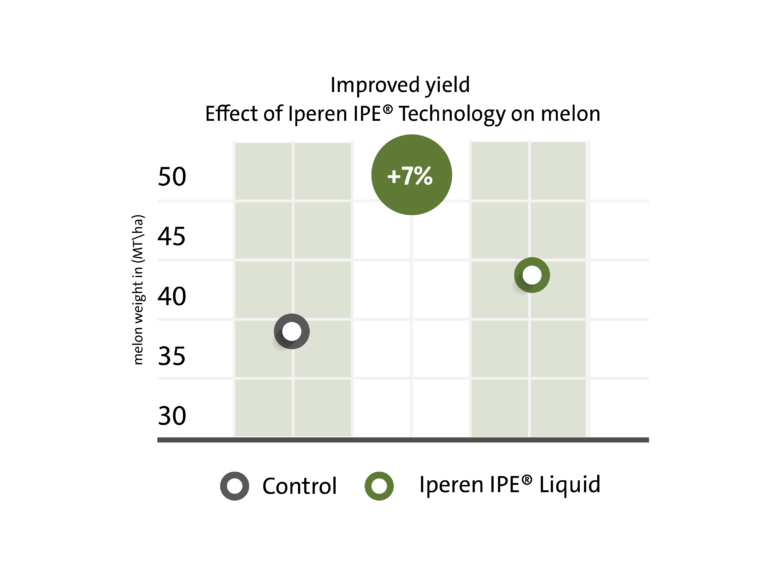 Growers who work with IPE® Technology use less Phosphate and see better results. 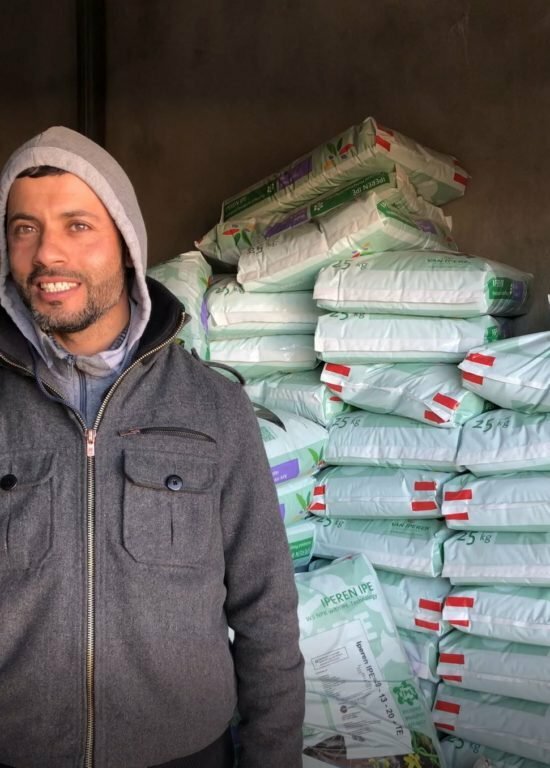 In addition, they benefit from the positive side effects: the soil structure improves as well as the availability of Micronutrients to the plant. Trials on bare land with Iperen IPE® Technology showed very positive results on the increase of plant available Phosphate in the soil. This was measured in the soil solution, comparing plots enhanced with Iperen IPE® Technology to untreated plots. None of the plots were treated with fresh Phosphate, the increase was due to fixated Phosphate being released from soil particles. 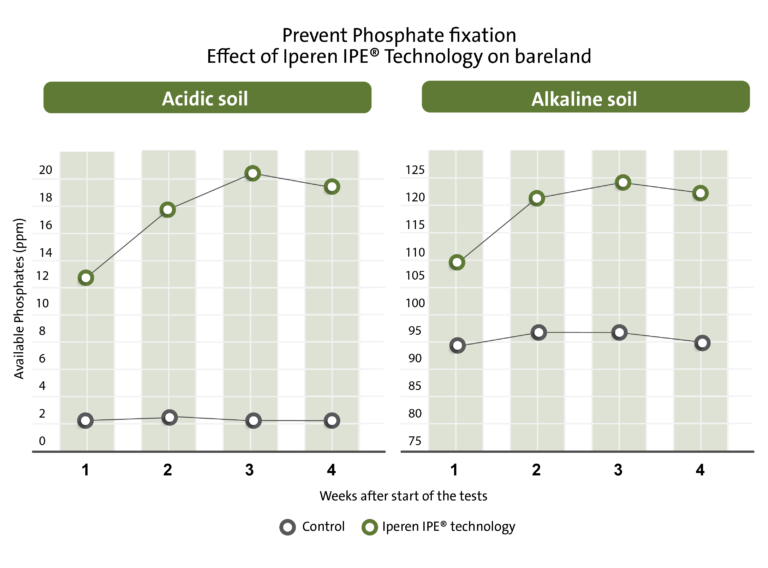 Depending on the type of soil, the level of fresh available Phosphate increased up to 100%, as shown in the graphs. A clear Iperen IPE® effect! We also checked the Iperen IPE® effect on reducing the fixation of fresh applied Phosphate. A control plot with 50 ppm of added Phosphate in the form of Monopotassium Phosphate (200 kg/ha) was compared to plots where Iperen IPE® was added in addition to the 50 ppm of Phosphate. In the control plot, almost all fresh applied Phosphate was fixated to the soil soon after application. 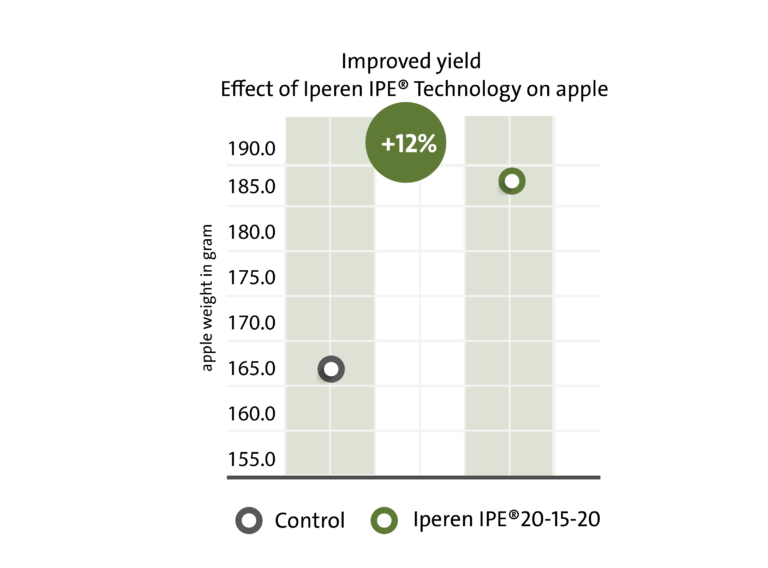 In the plots with IPE® Technology, the amount of available Phosphate increased significantly for a longer period of time, as shown in the graphs. 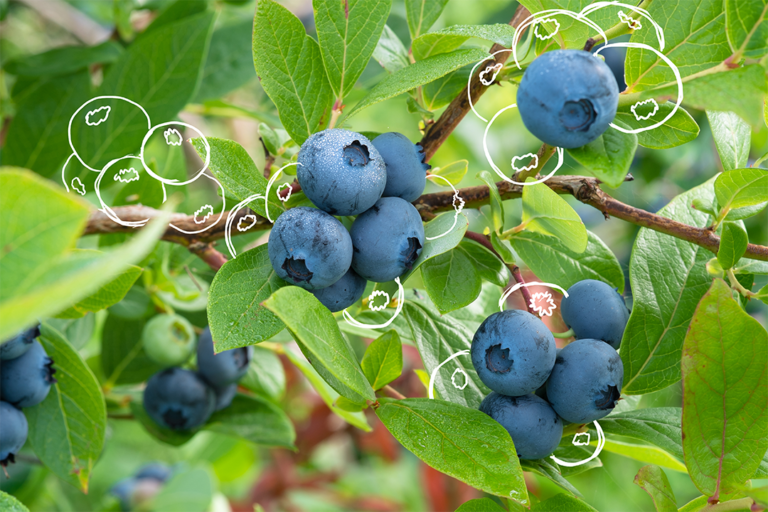 Another proof that Nutrient Use Efficiency increases with Iperen IPE®. Along with the effect on Phosphate, we observed during the trials that IPE® Technology improves the uptake of several Micronutrients. For example, as shown in the graph, we observed an increase of 30% of available Boron in the soil solution on the lettuce trial. We also observed a higher level of Micronutrients in petioles analysis, +75% Iron and +31% Manganese in sweet melon. 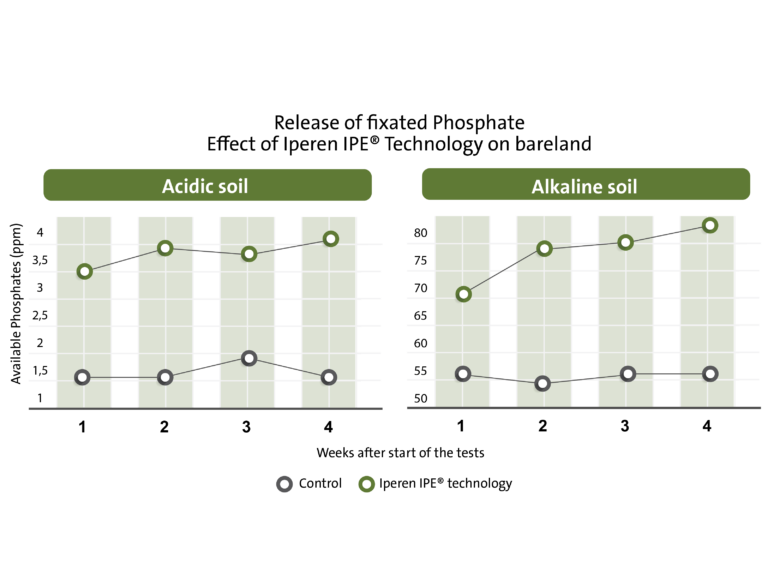 As Phosphate is a crucial element that determines plant performance (rooting, flowering, energy needs etc.) it is only natural to have a better yield and overall performance once it is more readily available to the plant. With a powerful start of the season, with adequate rooting and flowering, the crop is ready for a good yield. This is why, using Iperen IPE® Technology in the early stages prior to entering the production phase has direct effect on the yield. We have demonstrated in numerous trials on various crops the increased yield when using Iperen IPE® Technology. Several trials with Iperen IPE® on lettuce showed positive effects on initial plant development, when applied via fertigation. 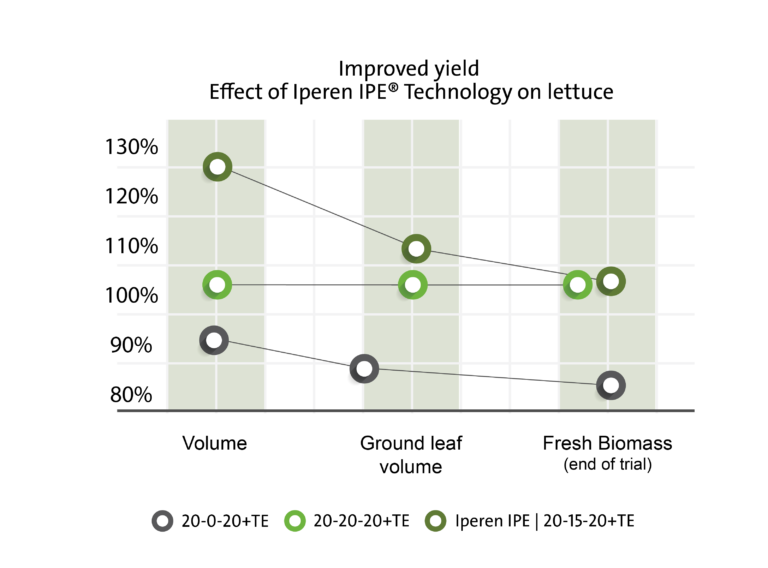 In the example shown in the graph, three plots were compared. One where no Phosphate nor IPE® was applied, a second where 20 kg/ha of Phosphate was applied, and a third where 15 kg/ha of Phosphate and IPE® was applied. After 20 days, the volume and leaf ground coverage were highest in the IPE® treated plots. The same goes for fresh biomass at the end of the trial, even though fresh applied Phosphate was reduced with 30%. 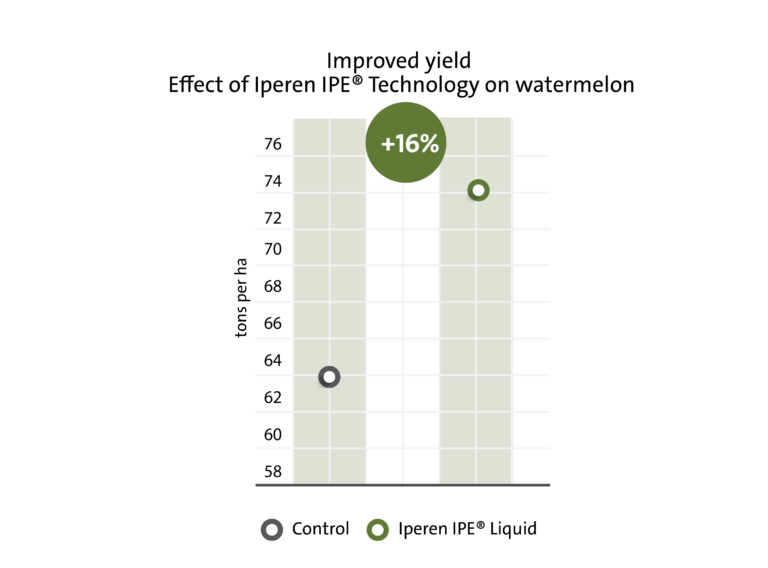 Trials on melon with Iperen IPE® improved the final yield, resulting in an increase of 7% compared to the traditional fertilization program of the grower. In addition, it allowed to reduce the application of Phosphate by 20% without affecting the yield or the quality in terms of size and taste. Trials on watermelon with Iperen IPE® improved the final yield, resulting in an increase of 16% compared to the traditional fertilization program of the grower. Trials on apple with Iperen IPE® improved the final yield, resulting in an increase of 12% compared to the traditional fertilization program of the grower. Interested in more trial results? Are you interested to receive some more in-depth trial results on Iperen IPE® Technology or one of our other High Performing Solutions? Please contact your Van Iperen Sales Manager or send us an email at: info@iperen.com. Iperen IPE® Technology is available in both liquid and Water Soluble NPK formulas combined with chelated Micronutrients. The range offers a suitable solution for the different phenological stages of the crop cycle. 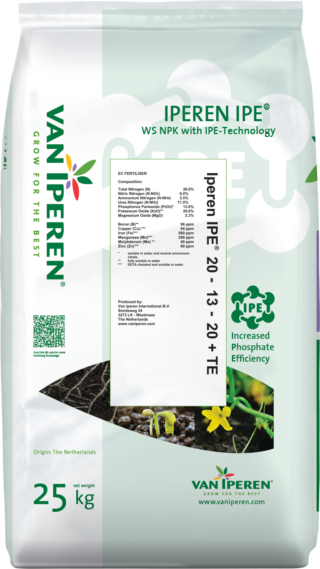 The Iperen IPE® Technology will help to improve root and shoot growth, vegetative growth and gives high quality buds and fruits, all with less Phosphate applied. Iperen IPE® | 11 - 44 - 11 + TE is a pure WS NPK with a high level of Phosphate combined with EDTA chelated micronutrients. Due to the Iperen IPE-Technology the Phosphate efficiency is comparable to 10 - 52 - 10 + TE which contains 30% more Phosphate. Our product has a limited caking sensitivity and is recommended during root and shoot development. 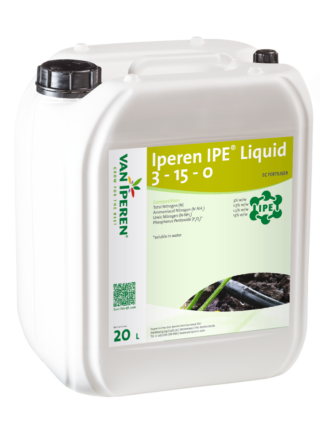 The Iperen IPE Technology in our formula releases soil fixated Phosphates and overcomes the precipitation of fresh applied Phosphates. The IPE-effect has been proven in many scientific trials. Today IPE Technology is used globally to better manage Phosphates needs. Iperen IPE® Liquid | 3 - 15 - 0 is a unique formulation based on the Iperen IPE® technology. It improves Phosphate and Micronutrient efficiency. Our product is a stable solution compatible with all Phosphate based straight fertilizers (e.g. MAP, MKP, UP). It is especially suitable during the first half of the crop cycle. The Iperen IPE® Technology in our formula releases soil fixated Phosphates and overcomes the precipitation of fresh applied Phosphates. The IPE-effect has been proven in many scientific trials. Today IPE® Technology is used globally to better manage Phosphates needs. Produced in our own plant Euroliquids. Iperen IPE® | 20 - 13 - 20 + TE is a pure and balanced WS NPK combined with EDTA chelated micronutrients. Due to the Iperen IPE-Technology the Phosphate efficiency is comparable to 20 - 20 - 20 + TE which contains 30% more Phosphate. Our product has a limited caking sensitivity and is recommended at different phenological stages especially during periods root and shoot development. The IPE Technology in our formula releases soil fixated Phosphates and overcomes the precipitation of fresh applied Phosphates. The IPE-effect has been proven in many scientific trials. Today IPE Technology is used globally to better manage Phosphates needs. Produced in our own plant TTD.